Tile industry teamwork is what powers so much of the awareness of quality labor and the importance of tile industry installation standards and best practices. Not only do you see it happening within the Top Tile Associations and Organizations, but you see it regularly in action when hands-on Certified Tile Installer (CTI) evaluations take place, starting with the tile companies that host the evaluations. Here's a perfect example of the type of industry teamwork we're talking about. Mark Heinlein CTI #1112 and CTEF/CTI Evaluator, pictured above (and in the video below) with Artistic Tile owners Diane and Carl Dubberly, explains how much teamwork is involved for such an event. Artistic Tile in Nashua, New Hampshire, hosted a CTI hands-on evaluation test in their work area on site. 11 people were registered to take the test, including installers from Artistic Tile and other organizations. Artistic Tile focuses on residential high-end tile installations with custom showers and backsplashes. They service customers from northern Massachusetts, New Hampshire and into Maine. In addition to everyday porcelain and ceramic tile, you'll find high-end tile, both handmade and waterjet cut brand name tile at Artistic Tile. The company has design professionals on staff. Although they offer installation, they also work with contractors and design-build professionals. Next, you have those who've decided to become Certified Tile Installers and take the hands-on evaluation. In the case of this test taking place at Artistic Tile in Nashua, of the 11 persons taking the test, 10 were taking it for the first time and 1 was re-testing. All but one of the 11 finished the test in the allotted time. This is an excellent result in itself and is a reflection on the organization of the host and appropriateness of the test location. "I recognize that each person putting themselves through this experience is taking a big step forward and putting their pride, ego, skills, reputation and performance on the line. It is a big deal for them and I approach it seriously. Nearly every person who takes the CTI admits to it being a humbling and generally a great experience. I am certain the installers left with a renewed understanding of the application of industry standards and empowered to improve their marketability." In addition to the CTI evaluation, this event offered excellent real time training to two future CTEF CTI Regional Evaluators. The extra time taken for evaluator training meant that each CTI test taker got to witness the detailed evaluation and discussion of his or her installation work firsthand. Who's to say who learned more? A lot of teamwork is necessary to bring one of these evaluations together once a group of installers is ready and interested in taking the test. 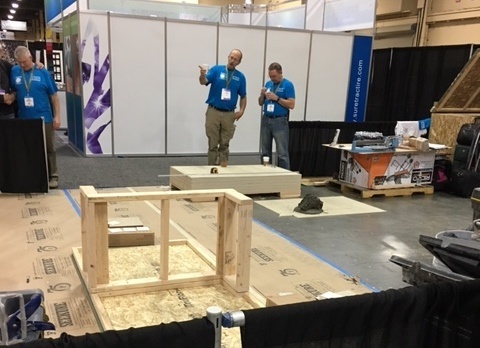 From a CTEF Staff perspective, Scott Carothers, Kevin Insalato and Cathey McAlister work with the installers and the host location - in this case Artistic Tile - to register, schedule and align all of the moving parts. 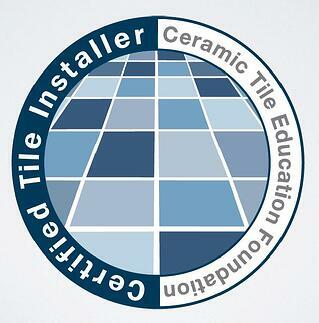 What also makes the CTI program stand out is how many tile industry members want to witness and support the program. Not only are these big events to schedule and coordinate, with many moving parts that must come into alignment, but the hands-on test itself is physically and mentally draining for the test takers and the evaluation team. NTCA Rhode Island Ambassador Matt Blood and NTCA Massachusetts Ambassador Stephen Belyea, outstanding representatives of the CTEF and Ambassadors of the NTCA in every respect, were present to support the expansion of the national network of Regional Evaluators to meet the ever growing demand for CTI status and Qualified Labor requirements and expectations. Mike Blasko, an actively involved NTCA Member Contractor, drove a long distance to volunteer support. He does an amazing job supporting all aspects of the CTEF CTI Evaluations and NTCA Workshops. He cares deeply about the performance of our installations and the people taking these tests and works to make everyone succeed to improve the average for everyone in the tile industry. Salvatore DiBlasi, also an actively involved NTCA Member Contractor, drove from Boston to provide the team with constructive support. Sal recently published a video detailing aspects of the CTI hands-on test. Business owners such as Russell Caminiti spent the day to support members of his staff who were taking the test. Russell is an NTCA Member contractor who is very interested in training and education and certification for his employees as part of his process to constantly improve his company’s performance level and reputation for successful installations. 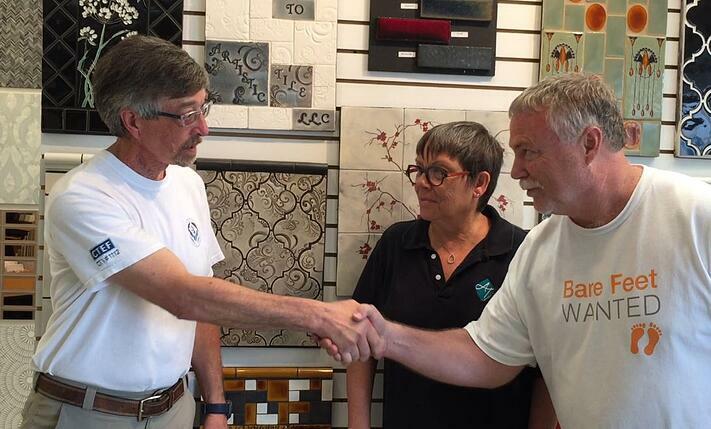 Here is a 2:47 minute video titled Tile Industry Teamwork in Action: Artistic Tile, Nashua NH in which Mark introduces Diane and Carl Dubberly. For those who take the CTI test and the businesses supporting the test-takers, the payoff is certainly about truly becoming Qualified Labor based on tile industry standards. It's also about supporting the tile industry and everyone who believes in delivering quality tile installations. Special thanks to Diane and Carl Dubberly for hosting a CTI hands-on test at their Artistic Tile in Nashua, New Hampshire. The preparation, generosity, professionalism and hospitality they provided made this evaluation a great success for everyone.